French President Emmanuel Macron on Thursday denied the U.S. president Donald Trump’s claim that NATO powers agreed to increase defense spending beyond previous targets. "There is a communique that was published yesterday. It's very detailed," Macron told a press conference in Brussels. He added the communique "confirms the goal of 2 percent by 2024. That's all." The summit statement affirmed a commitment made in 2014 after Russia annexed Crimea that NATO allies would halt defence spending cuts and start spending more as their economies grow, with the aim of moving toward 2 percent of GDP within a decade. On Wednesday, day one of the meeting, Trump took aim at NATO members’ defense spending, calling on allies to not only meet the minimum goal of spending 2 percent of GDP on defense, but also urged them to double that to a total of 4 percent. Turkish lawmakers on Thursday elected Binali Yıldırım as the first speaker of the Turkish Grand National Assembly under the new government system.In accordance with the Turkish Constitution, the speaker election was conducted via secret ballot.The first and second round of voting in the election for parliament speaker yielded no clear result, as all five candidates failed to secure the required two-thirds majority to win.Yıldırım was elected in the third round.Binali Yıldırım was Turkey's last Prime Minister, and served as prime minister until earlier this week, when the post was abolished under constitutional changes.The Nationalist Movement Party (MHP) announced that it would support the AK Party’s candidate.The voting process began at 2.28 p.m. local time (1128 GMT) at the Turkish Parliament.Former Parliament Speaker Ismail Kahraman watched the election process. Turkey's main opposition Republican People's Party (CHP) nominated Erdoğan Toprak for the post of parliament speaker. Toprak, a onetime youth and sports minister, is a lawmaker from the Istanbul province.The opposition Good (IYI) Party nominated Hayrettin Nuhoğlu for the post.Nuhoğlu, born in 1953, is also a lawmaker from Istanbul.The opposition Peoples' Democratic Party (HDP) nominated Meral Danis Bestas for the post.Bestas, born in 1967, is a lawmaker from the southeastern Siirt province. In the second round, Yıldırım got 336 votes, while Toprak got 131, Bestas 65, and Nuhoglu 42.Felicity (Saadet) Party candidate Cihangir Islamoglu got 4 four votes, and six votes were ruled invalid.In the first round, a total of 331 votes were cast for Yıldırım while Toprak got 134 votes, Bestas 65, Nuhoglu 43, and Firat 4, and four votes were ruled invalid.In the third round of voting, a minimum of 301 votes is needed. If a fourth round is necessary, the candidate with the largest number of votes is elected.The AK Party holds 290 seats in parliament, while the Republican People’s Party (CHP) has 144 seats, HDP 67 seats, the MHP 49, IYI Party 42, Saadet Party 2, Democrat Party (DP) 1, and Grand Unity Party (BBP) 1. Only five NATO members have met the 2 percent benchmark to date, including the U.S. NATO expects the number of countries that are meeting the guideline to rise to eight this year, and expects the number to rise to 15 by 2024. Trump, however, sent a tweet from the summit insisting members "must" meet the goal, set in 2014, "IMMEDIATELY." Macron said he did not believe it was necessarily a good idea to raise the target for NATO members’ defense spending to 4 percent of GDP from 2 percent, as Trump has suggested. 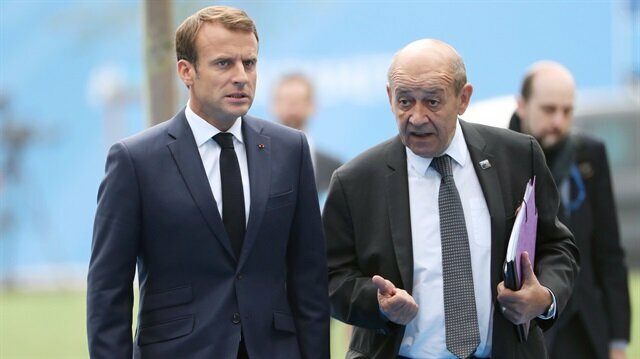 The French president also denied reports that Trump threatened to withdraw his country from the NATO military alliance in a dispute over funding. "President Trump never at any moment, either in public or in private, threatened to withdraw from NATO," Macron told reporters. He said the leaders of the alliance’s 29 members met in an extraordinary session on Thursday morning at the request of NATO Secretary-General Jens Stoltenberg. Supreme Electoral Council (YSK) Voter Search, where will I vote?